Canada’s political capital, Ottawa, has undergone a renaissance in recent years. Thrilling with hip festivals, gourmet cuisine, the world’s longest skating rink, and tons of European charm, what was once dubbed ‘the most dangerous in North America’ is now one of the country's most vibrant cities. Where: On the lawns facing the Parliament Buildings on the banks of the Ottawa River. What: The seat of Canada's federal government, Parliament Hill (known locally as The Hill) is a big hit amongst Ottawa’s ever-growing yoga community. In the summer months, thousands of devotees head to front lawn every Wednesday between 12pm and 1pm. Highlights: Originated in 2006 by an instructor from Lululemon, the international brand selling yoga-inspired athletic apparel, yoga sessions on Parliament Hill have become a much-lauded annual event. The sessions last for approximately one hour and attract up to 2,500 participants - usually a mix of office workers, diehard fitness fans and visitors eager to salute the sun and perfect their moves. Suitable for beginners and seasoned pros, this free-of-charge event is organised by professional instructors at Lululemon in the Rideau Centre. Where: At 140 Slater Street in the downtown business district, close to Bank Street. What: One of Ottawa’s only boutique hotels, this ultra-chic property (complete with a full stop in the middle) adds a touch of glamour to an uninspiring office-lined street. Each of the 112 designer-led guestrooms, including two Executive Suites, six Junior Suites and seven Luxury Suites, allure with earth-toned décor, state-of-the art trimmings, and high-end spa products. The nightly turndown service includes Belgian chocolates and a Granny Smith apple. Highlights: Sip signature martinis at cocktail hour in the ARC Lounge, an upscale watering hole with intimate booths, subtle lighting, red-padded walls, and squashy leather sofas. The fine-dining ARC Lounge Restaurant is one of the most buzzed-about in the city for well-priced seasonal fare. Eat, drink, and work it all off afterwards at the on-site gym. Rooms from £90 per night. Where: 75 Nicholas Street, in the heart of downtown within walking distance of Parliament Hill. What: Housed in the former 19-century Carleton County Gaol, a maximum security holding facility that was the nation’s most effective prison, the quirky HI-Ottawa Hostel is rumoured to be one of Canada’s spookiest buildings. Opened as a hostel in 1973, brave and thrifty backpackers can spend the night behind bars in an authentic wrought-iron cellblock. Highlights: Enjoy prison hospitality at Mugshots, Ottawa's only jail bar that doubles as a cool underground music venue. Accommodation is every bit as basic as one would imagine with iron-barred doors, window bars, and stairs with ‘suicide bars’ that once prevented prisoners from plunging to their deaths. Stay in a shared or private jail cells - or bunk up in a dorm. Rooms from £43 per night, including continental breakfast. Where: East of Parliament Hill, on the corner of George Street and Byward Street. What: The heart and soul of the city for Ottawans, Byward Market is a historic farmer’s market and shopaholic heaven by day, and hip showcase of cool clubs, live music bars, and restaurants by night. Established 1826 by British military engineer Lieutenant-Colonel John By, it is one of Canada’s oldest and largest public markets, ranking as Ottawa’s top tourist haunt. Highlights: Hundreds of artisans, farmers, and merchants converge here daily to sell their wares. Nothing is off-limited; from locally-raised meats, flowers, cheeses, and beaver tails (a deep-fried cinnamon and sugar-sprinkled fritter) to home décor and kitsch souvenirs. The market opens daily from 6am to 6pm and houses over 100 restaurants and nearly 60 vintage and cutting-edge fashion boutiques. Where: 119 Murray Street (Byward Market) and 801 Bank Street (The Glebe). What: Founded by acclaimed pastry chef Jérôme Mantel in 1995, The French Baker ranks as ‘the best bakery in Ottawa’. Expanding his premises on Murray Street with hip brunch and lunch spot Benny’s Bistro in 1999 and then The Glebe in 2009, Mantel’s award-winning French bread and pastries continually seal the deal with discerning gastronomes. Highlights: Whilst the flaky, rich-textured and buttery croissants are supposed by some to be ‘the best ever outside of Paris’, there are plenty more sweet-tooth temptations. Chocolates, macarons, apple turnovers, almond croissants, raisin rolls and butter brioche are the most delectable crowd-pleasers. Speciality breads are baked in an old French oven using high-quality unbleached or organic flours with no added fat or sugar. Where: On the banks of the Ottawa River, directly across from Parliament Hill. What: Known as the Canadian Museum of Civilization until it rebranded in 2012, this visual and cultural curvilinear masterpiece was designed by Canadian architect Douglas Cardinal in 1989. Approximately 270,000 square-foot of display space is spread over four floors. Highlights: Showstoppers include the Grand Hall with the world’s largest indoor collection of totem poles, the imposing ‘wall of windows’ that spans 112 metres in length overlooking the Ottawa River, and the First Peoples Hall, an impressive space divided into four zones with exhibitions that highlight the cultural, historical and artistic achievements of Canada's First Peoples. The museum also houses the IMAX® theatre and the Canadian Children's Museum. Open daily from 9am to 6pm, admission costs £7 for adults and £4 for children aged three to 12. Where: A 30-minute drive from downtown Ottawa, just 15-minutes from Parliament Hill. What: Once the summer residence of Canada's 10th Prime Minister William Lyon Mackenzie King and now home to over 50 species of trees, birds and mammals, this sprawling 224-square-mile urban park is paradise for hikers, campers, bikers, snowboarders and cross-country skiers. Highlights: With six public beaches and hundreds of nature trails, this stunning parkland is perfect for picnics, swimming, canoeing, rock-climbing, fishing, mountain biking, roller-blading and downhill skiing. Budding ecologists should check out Pink Lake, near the park’s south entrance. This bowl-shaped lake (really green in colour) is meromictic, meaning that the waters of the upper and lower levels do not mix and what is actually pink lies unseen around 13-metres below the surface. Where: At 56 approved sledding slopes throughout the city. What: Also known as sledding, sliding and tubing, tobogganing is a big deal in Ottawa. Whether you choose to zip down a snow-covered hill on a wooden toboggan, plastic sled or even a piece of cardboard, do not dare to leave Ottawa without tackling the city’s ice-cool hotspots. Highlights: Thrillseekers should hit Carlington Park (937 Clyde Avenue) for the city’s steepest toboggan hill, and the Arboretum at the Experimental Farm (next to Dow’s Lake on the Rideau Canal) for varying grades of steepness and more dangerous spins. The less brave can enjoy frozen fun and more gradual semi-steep slopes at Green's Creek Conservation Area (off Bearbrook Road), and Mooney’s Bay Park (2960 Riverside Drive), a city-wide man-made hill with great long runs. Families with small children should try Hog’s Back Park (off Prince of Wales’ Drive) for smaller hills and plenty of snow. Where: At various locations throughout the city. What: Named Best Festival City 2014 by Festivals and Events Ontario, Ottawa has perfected the art of festivals with a packed calendar of back-to-back events. Best known is July’s Canada Day, the country’s huge annual birthday bash, followed by May’s Canadian Tulip Festival, and October’s Oktoberfest, an almighty festivity of music, food and of course, beer. Highlights: Some of the best summer music festivals include the TD Ottawa International Jazz Festival, Ottawa Chamberfest, Bluesfest, and the relatively new Music and Beyond Festival - a classical music and multi-disciplinary arts festival. Other highlights are Carnival of Cultures (June), Ottawa International Children's Festival (May) and Winterlude (January and February) where activities include learn-to-skate clinics, ice carvings by international artists, hockey tournaments, culinary events and Snowflake Kingdom, a children’s snow playground. For 2014’s festival calendar. Where: Winding through the heart of Ottawa before connecting with the Ottawa River. What: Ottawa's defining outdoor attraction is the historic 126-mile waterway that travels south to Lake Ontario, connecting lakes and rivers through a series of 45 locks. In winter, the entire canal freezes over to become the Rideau Canal Skateway, the world’s largest skating rink. Highlights: Stretching over 7.8-kilometres, the Skateway begins just steps from Canada’s Parliament Buildings and extends to Dows Lake, just north of Hog's Back Falls. The Rideau Canal skate season typically runs from January to late February and skating is free. Rentals cost around £9 for two hours and are available from Capital Skates at Mackenzie King Bridge and Fifth Avenue, and Dows Lake Pavilion at Dows Lake. Along the way, skaters can stop to lace up their skates in heated chalets, and make the ubiquitous stop for hot chocolate.in designated ‘rest areas’ complete with fireplaces. 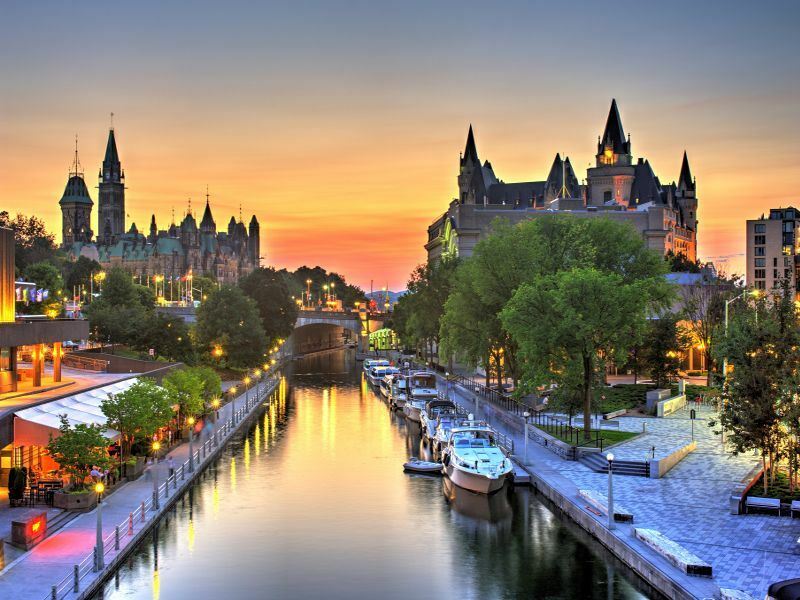 More information and to book: Canada’s capital Ottawa is perpetually stunning, home to picturesque parks, grand architecture and a wealth of culture.